Cool diorama, great use of the industrial barrels. 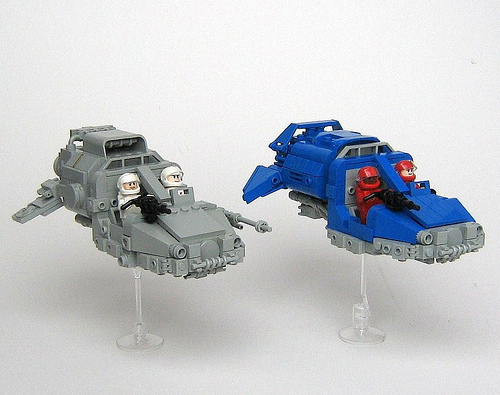 The latter ships look like pretty good renditions of the 40K Space Marine Land Speeders. So awesome! I just love the yellow barrels. Where can I get some good classic space graphics? WOW, those “classic” space vehicles look offley lot like Space Marine land speeders. Is there a revolution going on in LEGO land of copying Warhammer??? The stickers are from ebay. The fleshy faces in the Classic Space outfits (even if they are custom colors) are freaking me out, for some reason. I keep meaning to look up those clear visors, and this scene finally reminded me to. Looks like they weren’t actually made in any set, though, and currently aren’t for sale on BL– are the clear ones special pieces like the red Vader helmet? @Morgan19: Yes, the trans-clear visors are non-production parts that never appeared in any sets (like the red Vader helmet). Fortunately, when I bought mine, they were “only” about $0.80 each on BrickLink, plus shipping from Germany. Hey, on a related note: that has to be the very first african/black space marine I have ever seen. 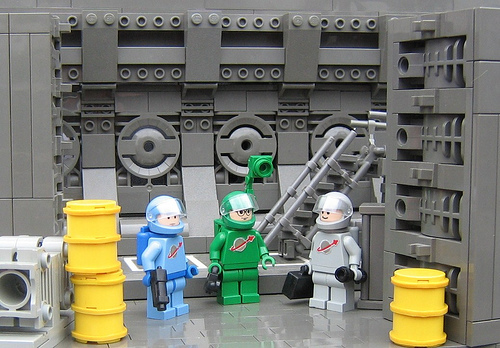 Wow, love the minifig colors, btw how to create the yellow barrels?